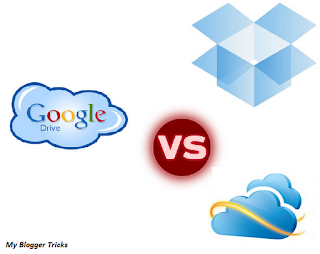 SkyDrive vs DropBox vs Google Drive - Which One Is Better? The world is increasingly getting technologically advanced, and Cloud Computing is growing more and more popular. The hard drive is not the only store of information, and most people are using one form or another of storing their information online, be it personal photos on Facebook, or contacts in Gmail account. But there are many free dedicated cloud based storage services to choose from. However, the major competitors in this area are SkyDrive, DropBox, and Google Drive, which we talked about yesterday. They all provide similar functionality. So how well do they fare against each other? Let’s find out. In terms of free storage space, SkyDrive is definitely the better of the two. It provides you with a storage space of 7GB. And if you install their new app, Microsoft will give you an additional 25GB of free space absolutely free! Hence, essentially, you can get up to 33GB of storage for free with SkyDrive. DropBox offers a storage of only 2GB, which is kind of a let down, considering its other features. Google Drive stands on middle grounds, offering 5GB of free space. With DropBox, you can upload a file of any size through the desktop client, while there's a limit of 300MB if you are uploading through your browser. SkyDrive also limits browser uploads to 300MB, but you can upload any file up to 2GB through the desktop client. Google Drive limits file sizes to 10GB. But you can only upload a 10GB file if you have purchased premium storage. For a regular account, you can upload a 5GB file, which is essentially the total storage limit for free Google Drive users. If the regular storage space is not up to your liking, you can buy more storage. Once again, SkyDrive takes the lead in this area by offering the best pricing plans. You can get an additional 20GB of storage for $10 per year, an additional 50GB of storage for $25 per year, and additional 100GB of storage for $50 per year. So the best deal remains $0.5 per additional 1GB for one year. DropBox, again is behind the other two. It has the most expensive pricing plans. You can get addition 50GB for $9.99 per month, or $99 per year. For an extra 100GB, you need to pay $19.99 per month, or $199 per year. That makes a best deal of around $2 per additional 1GB for one year. On the bright side, DropBox has a referral program which rewards referrers with some extra storage space (500MB per referral up to 16 extra GB for free account, and 1GB per referral up to 32GB for DropBox Pro). If you sign up using my affiliate link, I will get a 500MB addition. And so will you! If you sign up regularly, you will get no extra space. So to get an extra 500MB, click here! Google Drive is again in the middle. For an extra 25GB, you pay $2.49 per month. A 100GB will cost $4.99 per month, and 1TB will cost $24.99 per month. That makes a best deal of about $0.3 per additional 1GB for one year. Although I must admit, paying up every month must be such a hassle. These services give you the option of synchronizing your files across multiple devices. You can download your uploaded files at any time. This is where SkyDrive takes a hit though. Both DropBox and Google Drive give you an option to select the files you want to sync. Weirdly though, SkyDrive has no such option. It will sync all your files, which can be annoying, since it takes up bandwidth, and you might not want to sync all the files. This is where Google Drive shines, since searching is Google's home turf. Google Drive not only searches for file names, but also for content within files such as word documents. Not only that, it has an advanced text recognition system (OCR) through which it can search for text within images such as scanned documents! SkyDrive is somewhat less powerful in this area, but it still can search for text within your documents. DropBox, however, is once again trailing the other two. It only allows you to search files by file name. All three services have clients that run on Windows, Mac, and Android. But here is a chance for DropBox to redeem itself. It supports iPhone, iOS, and Blackberry platforms as well, thus providing the widest range of compatibility. SkyDrive is available for iOS as well, with additional support for Windows Phone. Google Drive only supports Windows, Mac, and Android, with support for iOS along the way. It remains below the other two by far, but things could change fast, considering it is a relatively new service. This is an area where the superiority of one over the other is debatable. SkyDrive offers easy integration with other live products, and your Microsoft Office documents. If you use them a lot, then you should get SkyDrive. Google Drive is far behind either. It has excellent integration with services like Google Docs, Google+, Android etc. Hence, it can provide a seamless experience for users. DropBox, however, offers no such functionality on its own. It just acts as an online storage, with extra functionality provided by 3rd party apps. All these services offer support for most common files, such as PDF, image JPEG etc. Google Drive, however can display a lot more. Due to its integration with Google Docs, it can view Photoshop files, AutoCAD drawings, and more. Google Drives more than 30 file formats, and it has only just started. Now it's SkyDrive's turn to take a hit. Both DropBox and Google Drive keep backup for 30 days. They can also save any revisions in your documents, so that you can restore a previous form of a document that you edited. And even if you delete a file, you can restore it within 30 days. SkyDrive has no such feature though. Once you delete a file, it's gone forever! Google provides an extra layer of security with Google's 2-step protection. Hence, even if someone knows your username and password, they still can't access your files. No such feature is available for DropBox or SkyDrive though. DropBox, however, keeps a log of all the changes that were made to your files. And so does Google Drives. Which makes SkyDrive lose to the two again. All the services provide reasonable sharing options for communicating files to your friends and family. They also support collaborative work, meaning that all members can work on group project files at the same time and in the same place, hence no need for sending big and bulky attachments with emails. Google Drive is the best overall in terms of social integration, and ease of use. The searching is smart, the interface is elegant and pleasing, and it allows you to cut down on your attachments, and send people a link to the file(s) instead. Hence, Google Drive is perfect for you if you live in the 'Google Ecosystem'. SkyDrive is the best overall in terms of storage space, and accessing file. The SkyDrive web app is pretty smart and lets you integrate with all other computers you might have. You just need to install the app on those machines, and you can easily access files and folders from any system. And if you use Microsoft Office a lot, then SkyDrive is a must-try for you. DropBox is best when it comes to third party functionality. It has a large developer ecosystem built around it, while Google and Microsoft are their own developers. DropBox also offers powerful functionality. True that it only offers 2GB of space, but you can crank it up to 18GB by referring friends. Have you all even read the terms and conditions of Google drive while using it? Google Drive's terms say this - "When you upload or otherwise submit content to our Services, you give Google (and those we work with) a worldwide license to use, host, store, reproduce, modify, create derivative works (such as those resulting from translations, adaptations or other changes that we make so that your content works better with our Services), communicate, publish, publicly perform, publicly display and distribute such content." Nice Post. I am personally using google drive its Awesome and Google Drive App is really nice. Its the obvious answer Dropbox, perfect solution for individuals. Just because Google Drive is from the giant is not going to make much difference, but it would actually interest the ones who were tied with Google Docs. Officially we use SyncBlaze at work which is amazing for sharing and collaborating on our work with colleagues and partners. I used to love Google Drive until I met Microsoft's Skydrive because of some obvious reasons. Though I still use Google Drive, I am more on Skydrive after I transferred all my documents from Google Drive and put them in Skydrive. Dropbox and Skydrive both offer delta sync. What does delta sync mean? If you make a small change to a large file without deltra syncs the entire file needs to be re-uploaded to 'the cloud'. I'd prefer to use Google Drive but without delta support it's a deal breaker as i use True Crypt to ensure all my data is encrypted before putting it in cloud storage and without delta sync it would mean every time i made a change to my drive it would need to sync to entire 10G disk.